On my recent visit to the library I went to pick up a business book but of course I had to look around for a bit and picked up some other books. Well-Red Black Girl by Glory Edim. I remember this one got a lot of buzz last year and it looks like a wonderful anthology. Smoke Gets in Your Eyes by Caitlin Doughty. I know someone recommended this one not too long ago and I just can’t remember who! I’m sorry for not giving credit. 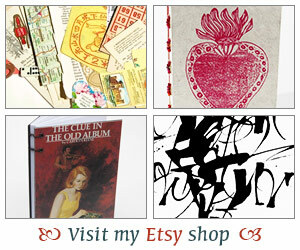 This is a memoir of a young mortician sharing her tale of how she ended up in the business. So bizarre and yet, so readable! Blue Label by Eduardo Sanchez Rugeles. This is the story of a young woman from Caracas, Venezuela who is at war with the world and on a missing to graduate high school and leave Venezuela for good. I think with everything going on in Venezuela currently this would be a fascinating read. Have you read any of these? What have you checked out from the library recently? Buriedinprint – Haha.. Yes, I did get the book I just didn’t show it because it’s not that interesting 🙂 And, yes, my older posts don’t take comments. I had to do that because I was getting a lot of spam. Thank you for the wishes! I’m hoping 2019 is going to be a great year for all of us! 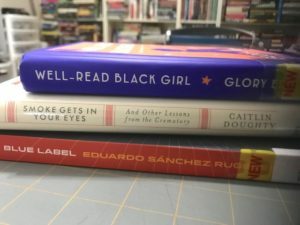 I took a peek at Well-Read Black girl when it came in at the library where I work. I have been trying to not take everything that looks appealing home, however, as I know I can never read so many library books. Your stack looks reasonable and very good! I haven’t read any of those, but I did make a stop at our library today. I’m kind of on a library roll these days. I’m currently reading The Cruelest Month (Louise Penny) and have Whiskey When We’re Dry (John Larison), Sea Prayer (Khaled Hoseeni) and Village School (Miss Read) on my nightstand after today’s visit. We’ll see how quickly I can get through these in the next few weeks! Danielle – It looks really good doesn’t it? I’ve been trying not to go overboard on library books and somehow still manage to end up returning books unread. Oh well! Les in OR – Woo,hoo! yay for being on a library roll. You got quiet a good variety there. I need to see if Louise Penny’s The Beautiful Mystery is free again. I had to return it half way through and want to know how it ended! Lark – Doesn’t that sound good? I hope I get to it! I’m intrigued with Blue Label. Hope you enjoy your books, Iliana.